[Image: Lebbeus Woods, from On the Malecón]. As a few people have noticed, the Quick Links section here on BLDGBLOG disappeared a few days ago; there are a variety of reasons for this, including an overall streamlining of the site design (moving to two columns from three, for instance). More importantly, over the past few years those Quick Links never actually showed up as part of BLDGBLOG's RSS feed, meaning that people who don't stop by the site itself, but prefer instead to read it through things like Google Reader, never even saw those links. This further meant that, during busy periods when whole days slip by between posts, BLDGBLOG would appear totally silent to those readers—when, in fact, new links were still appearing here at a reliable pace. In any case, to make a long story short, I will now be publishing frequent Quick Links posts—the first of which appears here. This will make those links easier to find and archive; these posts will now show up in my RSS feed; and this allows readers to comment on the articles I've linked to (something that the previous Quick Links system never allowed). If you have any suggestions for improvement, please let me know; I hope the much cleaner site design seems appealing, and that these Quick Links will continue to point you in stimulating directions... And happy new year! I hope this is a good one for you. —Olivia Judson looks at "memories in nature," where immune systems and plant forms display mnemonic traces. The biochemical archive. —Perhaps a machine-assisted, agricultural equivalent of this: keeping rare strains of livestock, including "huge dreadlocked Cotswold sheep," alive using the subzero techniques of cryopreservation. Distant shades of Pleistocene Park, perhaps. —Speaking of the Pleistocene, consider joining the Friends of the Pleistocene, "dedicated to exploring the conjuncture between landscape and contemporary human activity at sites shaped by the geologic epoch of the Pleistocene (2.588 million to 10000 years BP, Before Present)." —Perhaps we met yet artificially preserve the world's glaciers by wrapping them in huge blankets. —"Have researchers found dark matter at the bottom of a mine in Minnesota?" [Image: Ahmadinejad emerges from a highway tunnel; photo by Henghameh Fahimi for the Agence France-Presse, via the New York Times]. 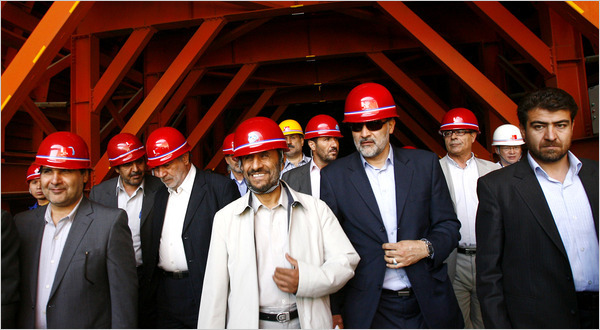 Heavily mountainous Iran has a long history of tunneling toward civilian as well as military ends, and Mahmoud Ahmadinejad has played a recurring role—first as a transportation engineer and founder of the Iranian Tunneling Association and now as the nation’s president. There are hundreds, perhaps thousands, of big tunnels in Iran, according to American government and private experts, and the lines separating their uses can be fuzzy. Companies owned by the Islamic Revolutionary Guards Corps of Iran, for example, build civilian as well as military tunnels. No one in the West knows how much, or exactly what part, of Iran’s nuclear program lies hidden. Still, evidence of the downward atomic push is clear to the inquisitive. Google Earth, for instance, shows that the original hub of the nuclear complex at Isfahan consists of scores of easily observed—and easy to attack—buildings. But government analysts say that in recent years Iran has honeycombed the nearby mountains with tunnels. Satellite photos show six entrances. It might be time to revisit geology in the age of the war on terror. [Images: A civilization beneath the trees; images via New Scientist]. —National Geographic visits the "geometric earthworks" previously hidden by tree cover in the Amazon but recently discovered via satellite photography. "Hundreds of circles, squares, and other geometric shapes once hidden by forest hint at a previously unknown ancient society that flourished in the Amazon," we read. 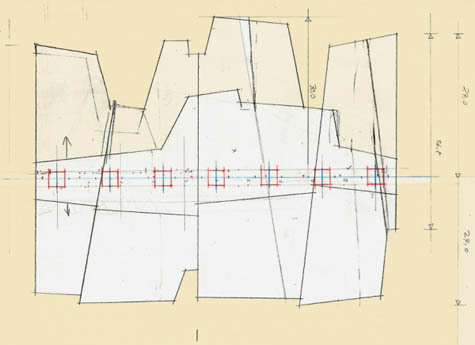 —Lebbeus Woods kicks off the new year with a look at Cuba's "malecón," the coastal road skirting Havana's massive sea wall (see the image that starts this post). 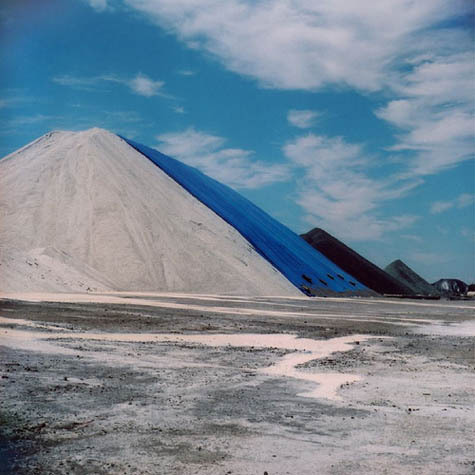 [Image: Piles of road salt outside Toronto. Photo by Flickr-user katalogue; via InfraNet Lab]. —InfraNet Lab looked into the dispersed geological presence of road salt, used to melt ice and snow, last winter—building into a three-part series about "sea dust." Part 1. Part 2. Part 3. —Finally, for now, L.A. Times architecture critic Christopher Hawthorne takes a long look at the building formerly known as the Burj Dubai and its growing role in cultural predictions of apocalypse. (Some links via @masoncwhite, @eatingbark, and the consistently wonderful Archaeology News). As one of the people using Google Reader who never knew about the Quick Links,thank you for this. No problem, Sam! Glad you can share in the links now, too. Excellent idea! Had seen the links on occassional trips to the site itself, but now this is great for us RSS folks! Thank you for considering our comments Geoff! As someone who has your blog as their start page I appreciate the return of the Quick Links. The two columns are growing on me, as is the extra white breathing space. Also, as I whinged about it before, black text = good! Like the quick links. This blog goes from strength the strength. Great stuff. Jennie, Pete, Jamiem, glad you like it. Pete, thanks for the feedback via Twitter, as well. Mike, if these occasional "quick" posts negatively affect your interest in clicking around the archives and/or blogroll (which has also been altered now into a rotating list of ten links), then I will have to think of something to get people to stay! Meanwhile, I hope the linked articles catch your interest. It will be nice to be able to have a conversation about these stories now, which never did work when the Quick Links section rolled off into oblivion without a corresponding forum. I like the new simplified layout. Very nice. I used to keep up w/ the quick links via delicious, but I'm glad to only have one feed now. Thanks for all the great content! Geoff, sorry, I should have been more emphatic with my "this works, too". The new layout really does work, and your dual point about the transience of the former quicklinks arrangement is a good one. This way, they get archived and can be discussed. As for incentives and excuses to linger and poke around - no worries, there's no shortage of that!